(Host) Burlington’s Centennial Field opened in 1906 and is one of the oldest ballparks still in use in professional baseball. Now the old, rundown ballpark has a new 20-year lease. Under an agreement released on Wednesday, it will be home to minor league baseball for at least the next two decades. VPR’s Kirk Carapezza has our story. (Carapezza) There’s a certain feeling that you get when you walk into a ballpark. The smell of the grass. The swift crack of the bat. The roaring crescendo of the crowd. That feeling in baseball is classic. But it’s also ephemeral. Your favorite players retire. Teams fold. Some ballparks break down. 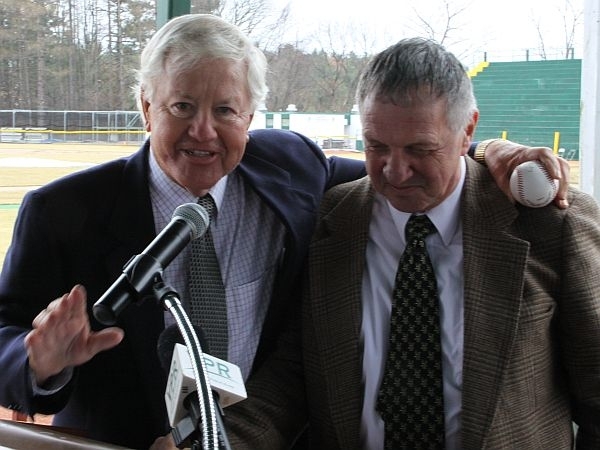 At a ceremony on the third base line at Centennial Field, UVM President John Bramley stood with Vermont Lake Monsters owner Ray Pecor as they announced a 20-year lease agreement between the university and the Single A baseball team, pledging to make sure Centennial Field wouldn’t breakdown. Bramley tried to avoid baseball clichés, but even the British cricket fan couldn’t help it. 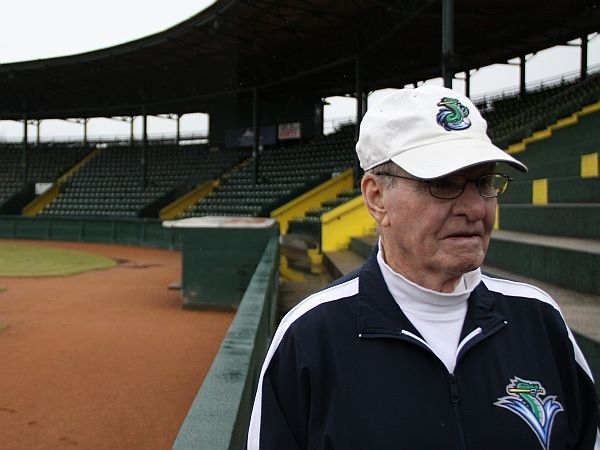 (Bramley) "I hope that by establishing a long-term lease that we can help Ray and the Lake Monsters attract others to step up and bring resources – I was going to say step up to the plate but I thought it was a little too cliché – step up and bring resources to expand those that we have committed ourselves." (Carapezza) The old ballpark needs all the resources it can get. An independent study a few years ago showed that Centennial Field needs more than $3 million to cover immediate upkeep and another $9 million to bring it to Minor League Baseball standards. Owner Ray Pecor is now charged with finding the money in a tough economy to make those repairs. He says conditions at Centennial had deteriorated so much that some teams threatened to stop playing in Burlington. (Pecor) "There was a great deal of pressure from Major League Baseball and Minor League Baseball that this facility just wasn’t acceptable. And now it’s our turn to make it acceptable and that’s what we’re going to do." (Carapezza) The private businessman says the Lake Monsters will begin by fixing the lights. (Pecor) "We don’t have power here right now. The dugout is a serious problem The visitors’ clubhouse. I mean those things just have to be done and soon." (Carapezza) After the ceremony, 81-year-old Ralph "Lefty" Guillette remembered playing high school ball at Centennial. (Guillette) "When I grew up baseball was it." (Carapezza) Guillette still works out with the Lake Monsters, and he tries never to miss a game at Centennial. (Guillette) "It’s such a friendly place. If you’ve got reserve seats open and you’ve got General Admission you can move into the reserve seats. Try that in Fenway Park." (Carapezza) Opening Day at Fenway is next month, but the Single A Lake Monsters won’t begin playing in Burlington until June. Under the new lease, the team will pay UVM a nominal $1 dollar each year for use of the field. That’s not a bad deal, considering the team was paying annual fees of $40,000.